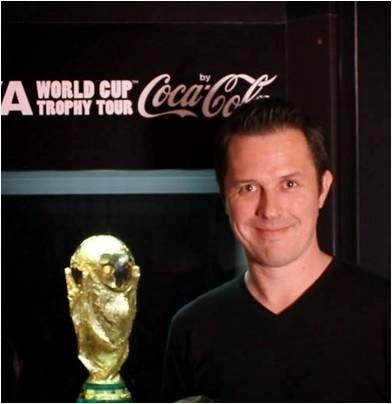 FIFA World Cup Trophy Tour by Coca-Cola - get a photo with the Trophy! The FIFA World Cup Trophy Tour by Coca-Cola has been running since September 2013 and sees the FIFA World Cup trophy touring the world in advance of the Brazil competition. Last night the #trophy was in Westfield in London (W12) and it was a great experience! After the photo adult attendees were then offered a choice of a complimentary Coke or Diet Coke. There was also the opportunity to play various football games like dribbling, shooting, skills etc, with attendees challenged to beat the performance of Daniel Sturridge the previous day. The Trophy Tour moves onto Glasgow today and then Cardiff tomorrow - all the information is on www.fifa.com/trophytour and the tour posts to Facebook at www.facebook.com/trophytour and Twitter @trophytour.